My mind went blank for a moment when a friend of mine said that he would be climbing Mount Merapi with his friends. It had been a while since I last climbed a mountain, which is Mount Rinjani in 2006. I doubted I would be able to climb Mount Merapi. On top of that, Mount Merapi, is an active volcano. On the other hand, I knew that climbing Mount Merapi would be an amazing thing to do. I knew that the landscape of Mount Merapi is so beautiful. In fact, from the top of the volcano you can even see Mount Sundoro, Sumbing, Lawu and Merbabu. This is the reason why I finally decided to join the climb. That and my love of nature. There’s something special about watching the sunrise from the highest peak. You see the land spread out below you for miles around. The sun is in the distance creating shadows over the landscape. It’s an incredible view and I want to share it with you. In this guide I want to share with you my experience climbing Merapi as well as reveal everything you need to know about climbing Merapi. It’s a trip I can arrange for you. I’ll start at the very beginning. It takes almost two hours to go from Yogyakarta to Merapi (New Selo Basecamp). It’s a long drive and although you can do it by motorbike I would really recommend taking a car. There’s a good reason for this; most people climb Merapi in the evening. Normally around 10-11pm at night. They do it so that they can watch the sunrise from the peak of Merapi. Of course it is possible to climb Merapi during the day, but most people don’t do this as it’s super hot. An alternative to climbing during the day is to hike to the top of the Merapi in the evening. This is a good option to do if you want to camp at the top of Merapi. I digress. The first time I climbed Merapi we departed from Yogyakarta at 10.30 pm and arrived around 01.00 am at New Selo, the base camp for Mount Merapi. When you arrive at New Selo the hike really starts. It’s around 4 km from New Selo to the summit. In terms of altitude the trek is from 2200 m to 2900 m above the sea level. It’s a four kilometres at an elevation of 700 meters on what can feel like a nearly vertical track. 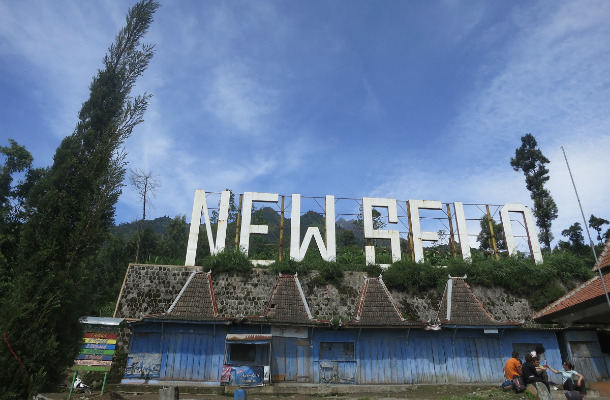 Most people need 4 hours to climb from New Selo to the peak of Mount Merapi. The first time I climbed needed 5.5 hours to climb to the first peak. When the sun rose I was not even at the top of the volcano, but I was almost there! The darkness (my torch was not good enough), my poor stamina, the cold (luckily me that it didn’t rain!) and the hard wind are all factors slowing me down. I was so lucky though because I had a great companion for the climb. The good thing about arriving late at the peak was that I didn’t get too cold. The second time I climbed I was freezing. I arrived well before sunrise and immediately I felt the cold wind. For this reason I’d really suggest bringing a warm coat and maybe some good gloves. There are two peaks to Merapi. The first peak is before the actual crater summit of the volcano. It’s a large bowel that is relatively flat and stretches out for a square kilometre or more. This is where people will normally camp if they are hiking to the top of Merapi. People call it Pasar Bubrah. The second peak is the crater peak. This is the really tough bit, which people start to climb just as the sun rises. It’s a 200 meter elevation up a shale slope of loose stones. When you climb this slope feels like you are taking three steps forwards and two steps back. It’s the most exhausting part of the climb and many people never actually make it to the top. By the time you’ve climbed to the top of this peak you will be tired and dusty. The view from the top though is 100% worth it. Oh, the other great thing about going to the top is that by the time you return to the bottom you normally have breakfast and a warm cup of tea. For many people the climb down is actually a lot harder than the climb up. One thing I can say about the climb down though is it’s a lot faster than on the way up. I actually made it in 2 hours, which is probably quite slow, but I felt proud of myself. Dusty, tired, but proud. Even though I was super tired, the journey was not painful, because the landscape was really amazing. So beautiful in fact that I have a really hard time putting it into words, so check out my pictures here. My legs were sore, but I was really happy that I had decided to climb Merapi. It was a great experience with wonderful new friends and good companions! What else do you need, right? Personally I love climbing mount Merapi because the view that you’ll get from Pasar Bubrah is just amazing (well.. I confess the views from the top are usually amazing!). 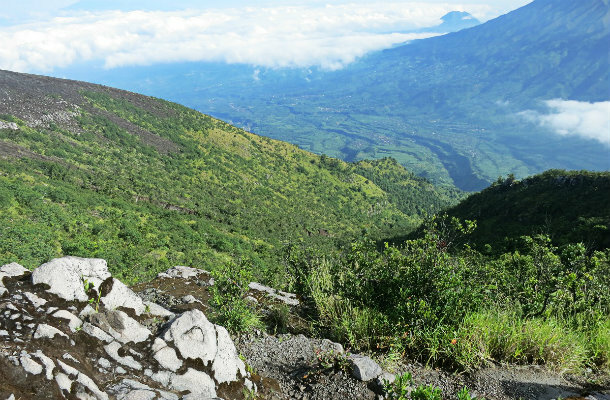 You will see Mount Merbabu to the north and Slamet, Sumbing, and Sindoro mountains to the west. It’s really special and something I recommend to all my adventurous friends who are visiting Yogyakarta for the first time. To get an idea of what to expect from the climb I’ve created this video. I hope you like it. Hiking Mount Merapi is one of the most fun things I’ve done in Yogyakarta and I suggest it to all of my good friends when they visit Yogyakarta (that’s actually my best friend who I climbed with in the video). To help you make the climb for yourself I’ve partnered with a local travel agency. Interested in hiking Merapi? Press the button below to find out more. Have you ever climbed a volcano? How was it and what was your biggest challenge? Contacted you regarding merapi hike, cave tubing and also sunrise. That looks like a really fun hike. It’s a really rugged looking mountain. I like scrambling up rocks like you’re doing in that picture. As far as volcanoes, I’ve hiked up Mauna Kea in Hawaii and done some hiking around the base of Mount St. Helens back home in America. Thanks for dropping by. I wish I can climb volcanoes outside Indonesia someday! Hi Firsta, thanks for sharing your experience. We are a couple in our early 30’s. We came across your blog as we are researching/planning a trip to Yogyakarta in three weeks including climbing of Mount Merapi. But having read repeatedly about how one has to be fit to make it, we are having second thoughts about our fitness/being able to climb it. You mentioned that it took you 5.5 hours to get to the summit. ln case we are slow in the ascent, do the guides wait for the climbers? I assume that we have to be on all four limbs sometimes to climb but did you ever have to pull yourself up using your upper arms/shoulders? Also, did they provide breakfast before the hike started? Are we required to bring our own breakfast with us? ooooo lewat New Selo butuh 4 jam-an ya? Sepertinya menarik nih buat dicoba. Tapi denger2, Puncak garuda udah gak ada ya gara2 letusan terakhir itu. Is it easy to arrange a guide for this trek in Yogyakarta? I am a solo traveller so probably need to join a group. I guess it is not that difficult at all. There are plenty tours provide this package. Hi Khairul, my friend is no longer in Yogyakarta. I’ll email you other options. Hi Firsta, thank you for sharing your experiences. May i ask for the contact details of the guide who took you up Mt Merapi? Sorry for the late reply. Sent you an email. your picutres are great. I’m planning a visit to Yogjakarta and I’m also wanting to hike Mount Merapi. Could you please send me the contact of your friend? Hi can I get the contact details for your guide? Hi Kerry, I’ll send you an email about it. Harus fit sih yang pasti 🙂 Coba aja yang lebih ringan dulu, seperti Prau atau Krakatau, kalau takut. Gempor gemporrr.. tapi happy.. Hehehe.. Btw, kamu naik turun dalam waktu satu hari di Lawu? OMG! Ya iyalah capek banget. I want to know good travel operators from where I can get guide for merapi. Approximate Price for that . Also fleece jackets will be enough to keep warm at night or not ? I sent an email to you. The price is Rp. 400,000 per person for Climb Merapi tour. Fleece jacket should be ok. Yes you should check out Merapi volcano if you visit Jogjakarta one day. I am really keen on climbing Merapi. But I’ve heard from a friend that the peak is actually far away from the top. Is it possible to go closer…even up to the crater? Also could you send me the contact details of your friend? :) Are tour guides mandatory for this hike or can we do it on our own? Also, while I am an avid hiker I might be coming with a friend who is not fit and with little hiking experience. Will it still be doable for her? Hi Lhavanya. You can climb all of the way to the top of the crater. Guides aren’t mandatory, but you will be climbing in the dark and I really advise having one as the route is not always clear and can be dangerous if you don’t know where you are going. I am happy to help arrange the tour for you. In regards to your friend, it is quite a hard hike to the top. I would adivse she exercise for the weeks before she arrives if she plans to hike Merapi. I’ll try to ask to the Merapi guide coordinator and will let you know if he knows Mr. Wondo that you are talking about 🙂 Will let you know via email. I’m interested in the hike. I’ll be coming in tonight by train from Bandung and I think I will immediately do some sightseeing. 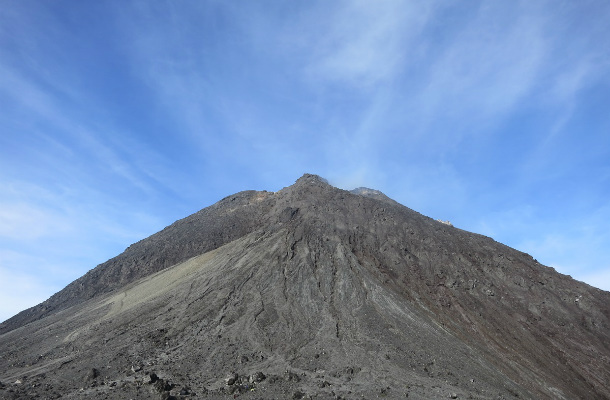 What is the pricing for the hike to mount merapi? A couple of friend and me would love to experience this hike. We leave for Java next week. Do you have any practical information (guides to recommend, prices for 6 persons from Yogyakarta and afterwards back to Yogyakarta etc?) to share with us or is it easier to search for tours when we are in Yogyakarta? I sent you an email few days ago. planning to Borobudur, Goa Pindul and Prambanan Temples. You suggesting climb at night. Wonder Mt Merapi is near to each other? I’ll be staying Jalan Dagen (city area i guess). Can pls email his contact information? Hi! 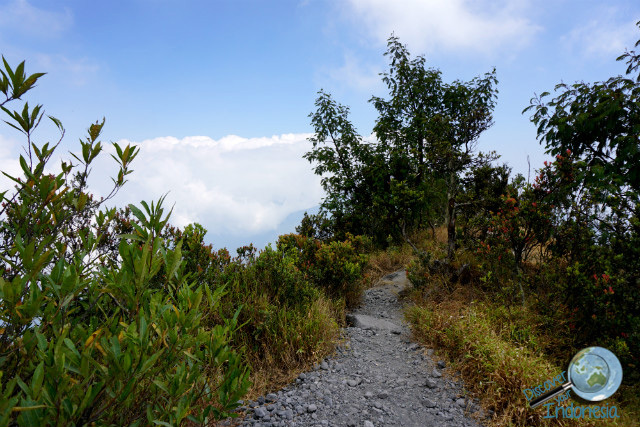 Thanks for the detailed write up on the trek up Mount Merapi. Just wonder if the weather in late december will be suitable for the climb? Could you share your guide details as well? Thanks a lot! I’m thinking of hiking up sometime on 5-8 Dec. How’s the weather usually? Rainy? Would this be a good time to hike up? How much is the package cost (transportation, guide etc.) from Yogyakarta per person (estimated 2-4 pax)? Sent all the details through email 🙂 Look forward to hearing back from you. I am thinking of hiking during the night on the 2nd week of December. How’s the weather and is it possible to reschedule the date with the guide if happens that the weather isn’t favorable? I will be staying near Taman Sari and I would like to know how much is the package cost (to and fro transport from accommodation, guide, etc) for 2. Thanks! I’m thinking of hiking up sometime on 1-3 Dec. How’s the weather usually? Rainy? Would this be a good time to hike up? How would you compare Merbabu and Merapi? Where can we store our luggages? How much is the package cost (transportation, guide etc.) from Yogyakarta per person (6ppl)? I sent you an email with all of the relevant information. Same as Ang, planning to hike Merapi on the 2nd week of Dec. Is it possible for me to travel to New Selo at night from Jogja to reach around 12am? Appreciate it if you could advise me how. Would love to get the information about the cost too! Thanks! Yes it is possible, you can join a shared transport tour from Yogyakarta. It requires minimum 2 people. It is Rp 450,000 per person. Please send me an email and I’ll share more details about it. Good job on your post, it’s quite informative and makes me want to trek Merapi even more. I’m planning to go there on a solo trip on 20/21 December, so I’m wondering if you could kindly send me the details as well? im planning a trip to merapi mid january with a group of 8-10 people. can u email me the details? I have sent you an email with all the details 🙂 Look forward to hearing back from you. I would be planning a trip next week, Would you be able to send me the details of the available guides and packages. Would appreciate it and hope to hear from you soon! Hi Remington. I sent you an email regarding your enquiry. We are two, and just arrived in Yogya today (Jan 11). We were hoping we might be able to climb tomorrow night to reach the summit first thing Wednesday morning. Is this possible with the rainy weather? And is it possible to travel from Yogya (and not spend the night in Selo)? We would be very grateful for any info. Many, many thanks! I’ll be going to Jogja on the 4th Feb 2016. Would you be able to send me the details of Mount Merapi tour. Would appreciate it and hope to hear from you soon! I came across your website. My friend and I will be going to Jogja in March, and we were hoping to trek up Merapi on 18th. Will you be able to provide us any details/packages? Thank you! Will provide the details on email. 🙂 I will send it shortly. comming July to Yogyakarta, I´d like to climb Mt. Merapi. Is it possible to climb the summit during day? I´m affraid my son is too young to do “regular” tour at night without sleeping all night long, although he´s in very good physical shape to make it:-) . Thanks for stopping by. Sure, I can arrange a private trip for you. 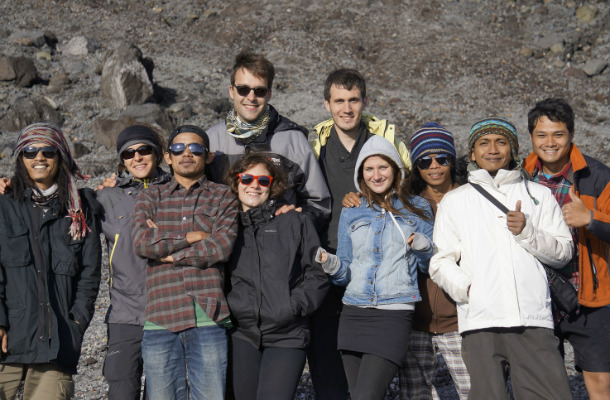 We are a group of students interested in trekking mount merapi! Can you advice us with more detailed informations and the cost for 10 paxs on 29th April? Thanks!! I have sent you an email regarding this matter. Look forward to hearing back from you. Hi Firsta, kita tertarik buat hiking merapi. Ada contact number yang bisa kita hubungi ? Trims. Sudah email-emailan ya 🙂 Thanks. Me and my friend are going to visit Yogyakarta in about 2 weeks time and we are looking for a guide for this hike. We came across your post while reading some reviews. It would be great if you are able to share with us a contact detail of the guide and the package that you would recommend for the 2 of us. Would like to have the details for hiking mt. Merapi. I am a traveler from Hong Kong and I am staying in Yogyakarta now. I would like to get some details about hiking Mt Merapi both at night or in daytime as I want to go there on 3/4 for 1 day but have not decided to go at night or not as my friend(about 3-4 person)doesn’t have many hiking experience. Hi Billy. I just sent you an email regarding your request. I am thinking of climbing Merapi on 02/04. I’m a solo traveller. Do you have pick up at Tentrem Hotel? Can you send me some details? I sent an email regarding this matter. Look forward to hearing back from you. Hi – is it best to sleep/camp for a night on the hike? How big is the group when you click the “book now” link with hotel pick up + guide? thanks! Hi Stevie, in average, 2 (the minimum) and it is possible until up to 12 people. Please fill the form if you are interested in booking. Have a great week! You don’t need any vaccinations if you are planning to come to Yogyakarta and Merapi volcano. Great, look forward to receiving your booking. My brother and I will be in Yogyakarta in early June and would like to do the hike on June 1st. Could you send more information regarding the times for the hike? It sounds like most people do the sunrise hike but is a sunset hike possible? Will it be too hot to hike at that time? Also, can you send more details regarding the different packages for us, including hotel pick-up information? Thanks! Hi firsta I just want registration and join for jobs! I’m a guide lokal in merapi, maybe if you need guide I’m ready!!! Apologies, I am partnering up with local guide association from New Selo village. Are you based in Yogyakarta? No I’m live in selo also! Can I know who is he? Hi Frista, I am a solo traveler planning to trek mount merapi tomorrow night. Can you please share with me the contact details of the guide? You can make a booking through the site. Hi Carly. 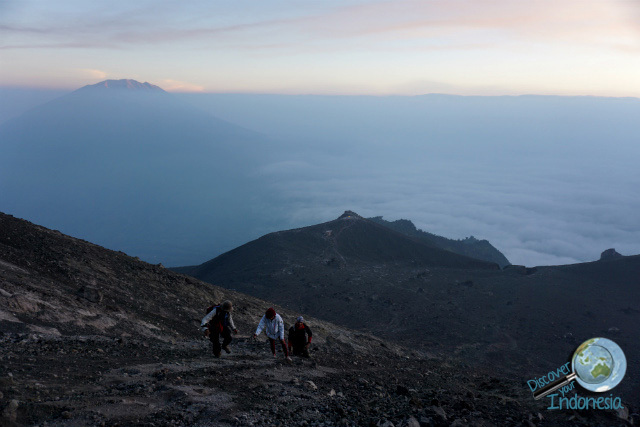 Climbing all three volcanoes is a great idea if you have the time. They are each special for different reasons. If you want to book the hike up Merapi please visit this page. Awesome post. Can I have the details of yr guide’ s contact . Hi Jen, I can help you with the reservation. Will get in touch through email. My boyfriend and I are leaving for Java next week and after reading your blogpost I would love to do this! Can you also provide me some more information regarding your friend who is a guide for the climb? Hi Teresa. You can find more information about the Merapi tour here. Please send me some details about the hike. I will be in Yogjakatar next month and would like to book this activity and combine it with the Goa Pindul – cave tubing. I am in Yogyakarta and didn’t get your email. It might have ended up in my junk mail but that folder is empty. Please resend me the details. Do you have a group I could join on Sunday 13th Nov? Hi Tom, we might have 2 people for tomorrow (still waiting for their confirmation). If you are interested in booking, please submit the form on this page at the soonest. I’m coming to Indonesia in March 2018 and im wonder if there is a chance to climb Merapi ? What about view, sunrise and weather condition in March ?! The tour runs every day with minimum participants 2 people. Please keep in mind that Merapi is an active volcano. U have experience with mnt Rijani and Merapi. I just did Merapi tour 2 days ago and planning to do Mnt Rijani in 1-2 weeks..but.. I only reached untill post 2 at 5.00 AM and couldnt do more. For me it was just to steep..seems my condition was bad and my knees are bad anyway. Would u consider Rijani in 3 days trek heavier? Cause i think estimated time from crater to summit Rijani is 3hrs steep! And them u already made a hike of at least 7 hours. I managed on character to post 2 in 4 hours Merapi but that was my max. I think i maybe better aim for the crater Rijani?? Could u give me some advise..considering my bad knees? 3 days 2 nights Rinjani (if you are aiming the summit) is already quite badass. I would recommend if you only have 3 days, just to go to the lake (Segara Anakan). Climbing to the summit will probably be too steep for you. Good luck! I like your blog, so much information and it looks fun too. So we can hike mount merapi for one day only right? Can I get the contact details of the tour guide that guided you the other day? My colleague Riri has sent you an email. Look forward to hearing back from you soon. Or dec 26 to 28 ? We can group.